We are pleased to announce that Craft Holdings Limited (CHL) have bought out the controlling interest in EFT-Craft Company Limited from Euro Façade Tech HK Limited in December 2017. We are now called Craft Façade Tech (Hong Kong) Company Limited. There is no change to Hong Kong’s ongoing services, company organization or personnel and our partners can expect business as usual. We have procured a curtain wall factory in South China and hired Jane Lin as General Manager. She brings over 20 years of experience of curtain wall manufacturing to the Group. The well-established factory is already producing the first Craft project panels for 2 curtain wall projects in Hong Kong and 1 project in Australia. 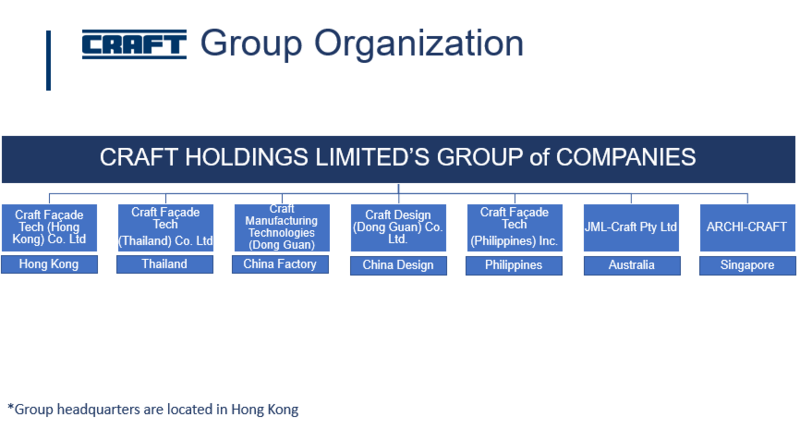 In Australia, Craft bought the majority shares of JML Group Holdings Pty Limited which is now called JML-CRAFT Pty Ltd. Michael Lavis, who has been key in JML’s success is continuing to support our business and our newly appointed Managing Director of Australia, Nathan Burchell. In Thailand, the construction of our new office is now complete and our team have hit the ground running by securing their first projects in Bangkok. In the Philippines, we now own Craft Facade Tech (Philippines) Inc. which was formerly known as Global Façade Tech (Philippines) Inc. Our General Manager, Rene Tolentino has over 20 years of experience in design and running operations in the Philippines. 2018 will be an exciting year as we also have plans to open new offices in Singapore, Taiwan and Vietnam. CHL and its subsidiary companies will continue to increase its service capability in the region offering innovative, hassle-free quality construction solutions using the “CRAFT” brand which has been known for in Asia for over 20 years. Keep updated with the latest Craft news and happenings. We share information from time to time regarding upcoming events, new products from our partners and other industry news. This iframe contains the logic required to handle Ajax powered Gravity Forms. We promise to never send you spam or sell your address to third parties. That’s the CRAFT promise!